Note: I am eager to make this course available to anyone who wishes to have the adventure of learning ancient Greek in W 2019. If you wish to take the class and are having difficulties enrolling, please email me at cconnors@uw.edu so that I can send you an add code. First year Ancient Greek courses give you direct access to the thoughts and writings of the ancient Greeks and allow you to explore the dynamic and often dangerous cultural, social and political world in which they wrote. Learning to interpret and use an ancient language requires you to explore unknown areas and think in new ways. Our focus is on Greek as a literary language. Course activities are designed to foster a collegial and collaborative atmosphere and to encourage you to make strong connections between the ancient language and literature we are exploring together and your other interests, passions and pursuits. Read and translate selections from ancient Greek authors and compose simple sentences in Greek. Students completing Greek 300 will be able to enroll in Greek 103 in spring quarter. 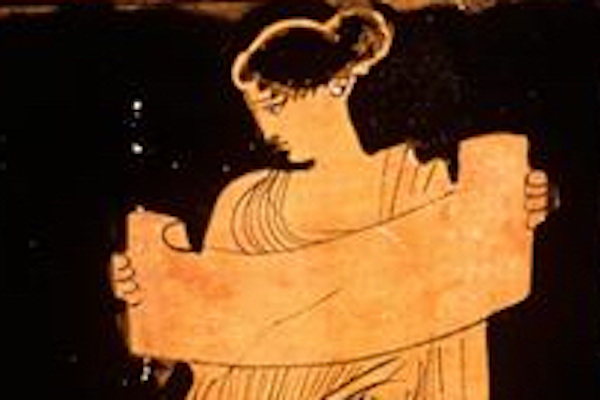 By completing the first year sequence through 103 you equip yourself to read any Greek author. In our second year courses (304, 305, 306, 307) students read selections of Xenophon (305), Plato (306), and Homer (307), and other authors (304). "Ancient Greek is super fun"
"Ancient Greek teaches problem solving abilities that can be transferred to any discipline"
"In addition to simply being a fascinating language, Greek at UW is a very enjoyable class that will be an extremely unique and fun experience for you as you tackle a complex new language." "Take Greek and learn to solve wonderful puzzles." "Greek is fun and the instructor does not nitpick you on incredibly small details"
"It is easy to say 'Oh it is Greek to me!' Why not join us and see how fun it is learning Greek for real." "Greek is a beautiful language. You won't regret it." Only the fourth edition should be used. This book explains Greek grammar and syntax and contains many short readings from ancient Greek authors. Anne Groton and James M. May 46 Stories in Classical Greek. This book contains selections, somewhat adapted, from many ancient Greek authors. Intensive introduction to Attic Greek. Not accepted as upper-division credit toward a major in Greek or classics. Does not satisfy foreign language proficiency requirement. Cannot be taken for credit if GREEK 101 already taken. Offered: WS.